When it comes to ‘’love’’, people think of a romantic affair between two people having been attracted by each other and including a sense of special and emotional relationship. There’s somewhere on Earth, particularly in Vietnam existing a place where people often visit and express their love for the other under the wonderful and romantic scenery. 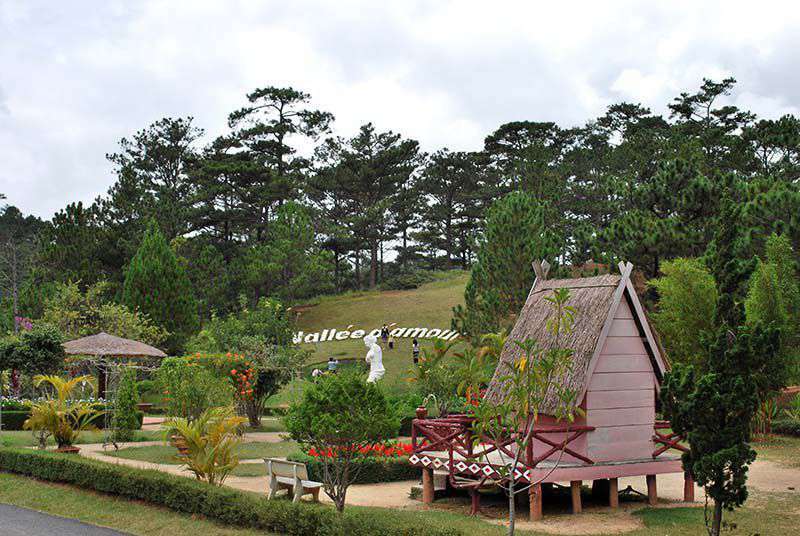 We call it the Valley of love, which is located 5km from the center of Dalat city to the north, known for its amazing tranquility full of beautiful landscape and an exactly suitable site for couples and married people. It can be said that the Valley of Love is an unspoiled scenic sight but poetic with tiny streams, lush green lawns and rolling hills. In the past, the valley was ever called Vallée D’amour (Valley of Love) by the French before being renamed to The Valley of Peace under the reign of King Bao Dai. Until 1953, Chairman of Dalat at that time suggested to change all the French names of lakes and streets in Dalat into Vietnamese name. Then, the name “Thung Lung Tinh Yeu” (Valley of Love) appeared and exists till today. 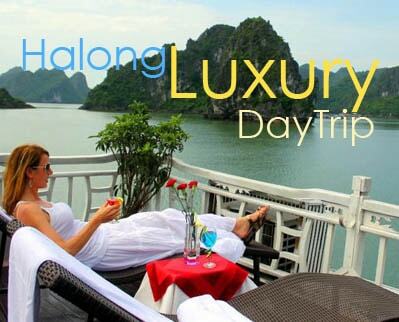 The entrance ticket is 100,000 VND (about 5 USD per person), tourists can have a whole day deepening into the glamorous and charming beauty of this valley with the one you love. 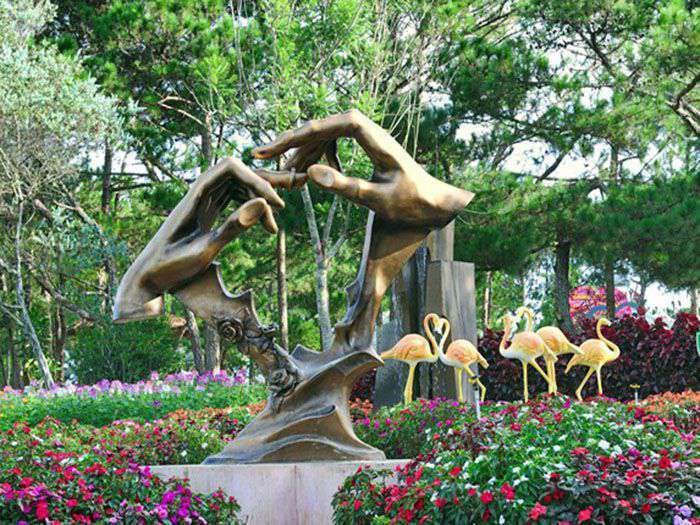 Arriving at the valley, tourists will have a chance to contemplate the image of two pairs of hands exchanging rings, a statue of couples affectionate to each other, or even benches symbolizing well-match couples. In 1972, there was a dam built across the valley forming Da Thien Lake, which much enhances the seductive beauty there and turns the valley into a common stop for tourists whenever taking part in any Dalat tours, especially for those couples who would like to enjoy their sweet romantic honeymoon. The tracks lead to Vong Canh Hill from which The Valley of Love’s magnificent view gradually appears in each tourist’s eyes. From that hill, you can also comfortably admire the Lang Biang peaks standing out vividly against the blue sky. 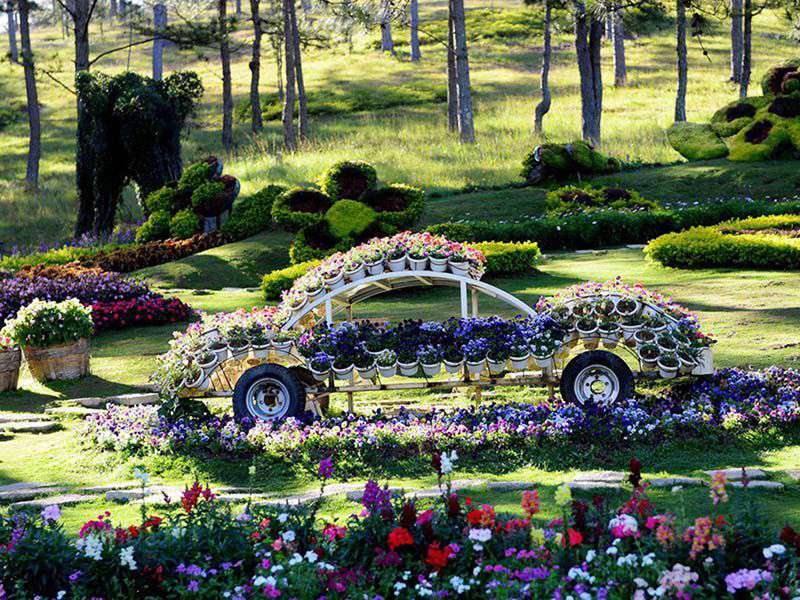 It’s true to say that Love Valley is the most poetic and dreaming attraction in Dalat. Tourists can depart from Phu Dong Thien Vuong Street to get here or from Xuan Huong Lake through Lam Vien detour – the road just newly built. What’s more, it is very interesting for tourists to cross the small bridge to admire a lyrical place surrounded by water, the Paradise Hill. The white balcony reflected in the lake is actually convenient for fishing or confiding in each other. Immersing in the windy nature, tourists seem to be lost in a dreaming paradise with endless blue and spectacular light refraction, creating a wonderful array of magical space. 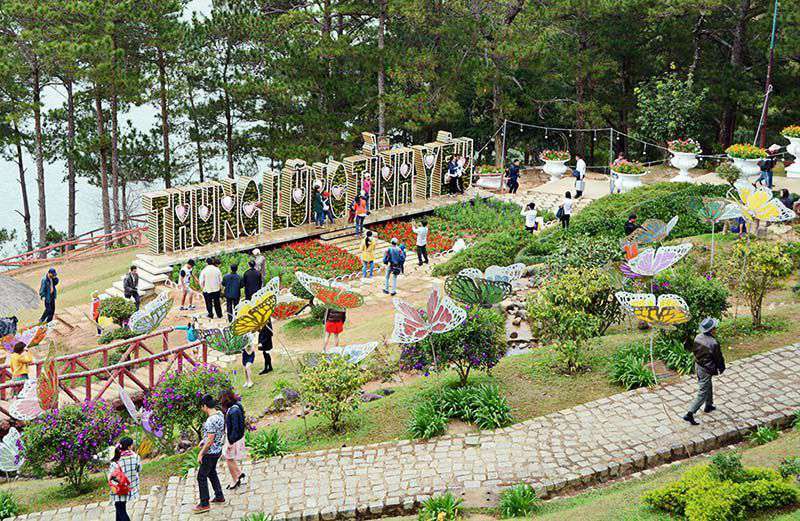 Having to say, if it is not for the wonderful combination of the flora and fauna together with the charming and peaceful small lake in an enormous area of Dalat, the Valley of Love cannot attract and appeal so many tourists. To meet the demand for sightseeing or admiring the beautiful landscapes, tourist area has collected US Jeep and put into operation. It also offers fascinating services, namely camping organization, campfire – “Can” wine night, team building with full facilities for tourists. In particular, the Valley of Love has been chosen to host numerous interesting events such as the annual Valentine’s Day (February 14), or the Kissing Festival, attracting the great number of participation of couples. Besides, Love Valley also organized sightseeing activities, excursions, entertainment in various and attractive forms, such as traveling on the lake with cano – pedalo, tandem bicycle, horseback riding, aerial gliders, or speed racing… Paint ball, among them is a fake fight game has long been familiar with young foreigners. This kind of game has come out a few places in Vietnam and tourists to Dalat currently can participate in the extremely dramatic game. So travelers might have no time relaxing but to join in a series of activities that are truly amazing and exciting, giving you such a wonderful time in a life where you can hardly find even one piece in your daily life!